Ridley Scott’s Alien was perhaps the first movie to reveal the true terrors of space, where no one can hear you scream. 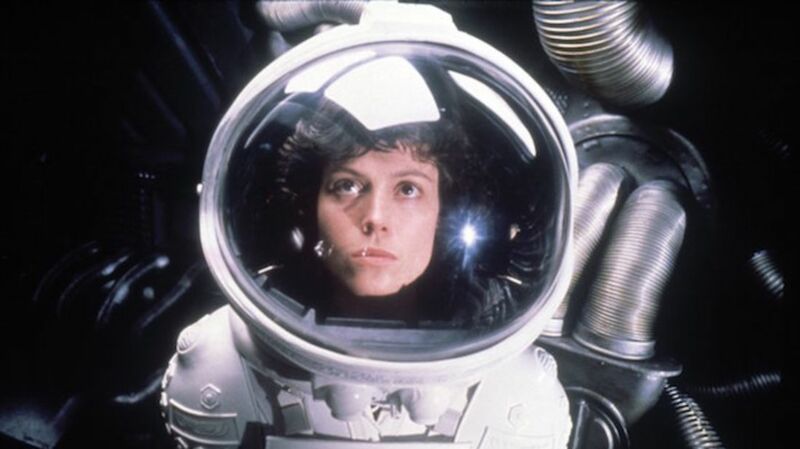 The 1979 horror sci-fi classic gave us spine-tingling new special effects and a revolutionary heroine in Ellen Ripley, the alien’s only worthy adversary. But she almost didn't make the movie. Find out how she wound up in the script, which rock band helped with the lighting design, and more interesting Alien facts below. 1. IT WAS ORIGINALLY CALLED STAR BEAST. When Dan O’Bannon was drafting the screenplay that would become Alien, he had a more unusual title: Star Beast. He didn’t like it, but struggled to find a better replacement until one late-night writing session. As he was typing dialogue in which the crew members discussed the alien, that word jumped out at him. He promptly ditched Star Beast for the more simplistic title, which he loved because it was a noun and an adjective. 2. STAR WARS GOT IT GREENLIT. Initially, Alien wasn’t an easy sell. O’Bannon and Ronald Shusett (who co-wrote the story, but not the screenplay) bounced between producers for a while, almost landing a deal with B-movie legend Roger Corman. But the script eventually went to a new company, Brandywine Productions, which had ties to 20th Century Fox. The three founding members asked for all sorts of rewrites, but each new treatment O’Bannon and Shusett returned wasn’t swaying the brass at Fox. Then Star Wars arrived and decimated the box office. Every studio in town rushed to get anything remotely sci-fi into production, so Alien got the green light. 3. A SWISS SURREALIST PAINTER DESIGNED THE ALIENS. All the aliens in the movie—the “facehugger,” the “chestburster,” the humanoid “space jockey,” and the big bad adult—were designed by the surrealist painter H.R. Giger. O’Bannon handpicked him for Alien. He had first met Giger in Paris while working on Alejandro Jodorowsky’s failed Dune movie. He was struck by Giger’s sinister images, and even more so by his actual demeanor. As O’Bannon recalled in The Beast Within: The Making of Alien, Giger offered him opium immediately upon introduction. When O’Bannon asked the artist why he took opium, Giger replied, “I am afraid of my visions.” O’Bannon assured him it was only his mind. “That is what I’m afraid of,” Giger said. 4. DUTCH CUSTOMS DETAINED GIGER FOR HIS DESIGNS. 5. RIPLEY WASN’T SUPPOSED TO BE A WOMAN. 6. ASH WASN’T IN THE SCRIPT. 7. THE SHIP’S NAME COMES FROM A JOSEPH CONRAD NOVEL. All the horror unfolds aboard a spaceship dubbed Nostromo. The name was ripped from the title of a 1904 novel by Joseph Conrad, which follows an Italian explorer sent to South America to plunder a silver mine. That’s not the movie’s only Conrad reference, though. The shuttle that Ripley uses to escape is called Narcissus, and that moniker refers to yet another Conrad novel, with a much more problematic title. 8. CAST MEMBERS CONSTANTLY PASSED OUT ON SET. Spacesuits (even fake ones) tend to get hot—especially when they don’t let any air out. Add in set lighting and a summertime production schedule and you have some truly sweltering conditions. Veronica Cartwright, who played Lambert, revealed in The Beast Within that the actors were fainting so regularly that a nurse was kept on standby with oxygen tanks. But the costumes weren’t actually updated until kids got involved. For a few perspective shots, Scott put his two sons in spacesuits. They also passed out, which finally forced the crew to modify the costumes. 9. A 6-FOOT-10-INCH NIGERIAN STUDENT PLAYED THE ALIEN. Bolaji Badejo wore the famous alien suit, and he didn't get the part through a traditional casting call. Badejo was in a pub in London, where he’d moved to study graphic arts, when a casting agent spotted him and immediately called Alien associate producer Ivor Powell. Powell and Scott had been struggling to find someone who fit the praying mantis aesthetic they wanted, but lanky 6’10” Badejo was just their guy. He took mime classes to get the alien motions down and sat on a custom swing in between takes. With a tail like that, chairs were out of the question. 10. THE EGG REQUIRED HYDRAULICS, HAND SHADOWS, AND COW TRIPE. Most directors make their cameo via a walk-on bit, not shadow puppets. But Scott’s big appearance in the movie comes when an alien facehugger appears to move inside its egg. As io9 noted, that was really just Scott flicking his gloved hands under the moving light. The egg also came outfitted with steel hydraulics along the top. And when it's all opened up? Those are cow intestines, not alien parts, nestled inside. 11. ROGER DALTREY HELPED WITH THE LIGHTING. When the Nostromo crew disturbs the facehuggers, there's a beam of blue light, which indicates early trouble. And you have The Who to thank for that. Lead singer Roger Daltrey was experimenting with lasers right next to the studio where Alien was shooting, and he graciously lent his equipment out to Scott. 12. THE ACTORS WERE GENUINELY SHOCKED BY THE CHESTBURSTER SCENE. For the iconic scene where a chestburster shoots out of John Hurt’s torso, Scott wanted the best possible reaction from his cast. So he deliberately kept details hidden from all the actors, aside from Hurt. They knew a creature would emerge, they had seen the puppet, and they were more than a little suspicious of the raincoats they’d been given. But they had no idea what kind of gore was in store. Their reaction to the bloody burst is completely genuine. According to The Guardian, Yaphet Kotto (Parker) shut himself in his room right after the scene and wouldn’t talk to anyone. 13. IT WAS INSPIRED BY DAN O’BANNON’S MEDICAL PROBLEMS. 14. ASH’S INNARDS WERE MADE FROM MILK AND MARBLES. Remember that weird white goo that seeps out of Ash’s android head when he’s decapitated? Scott’s crew made that from a combination of milk, caviar, pasta, and glass marbles. It was especially unfortunate for the actor playing Ash, Ian Holm, who hated milk. 15. THERE’S A CUT COCOON SCENE. The movie initially offered a much more concrete ending for Ripley’s crewmates Dallas and Brett. In a deleted scene, Ripley encounters them both as she’s rushing to the shuttle. They’ve been wrapped in an alien cocoon, and only Dallas can make out any words. When it becomes clear to Ripley that they’re beyond saving, she torches the entire cocoon. Almost everyone involved felt the scene dragged down Ripley’s escape, and since the original cut was well over three hours, it was left out of the final film.